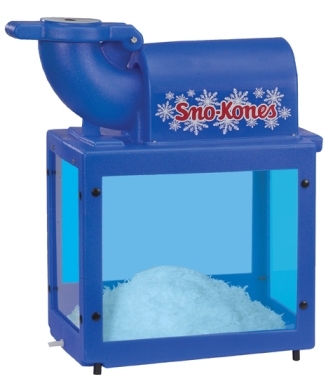 Everyone loves Sno-Kones and the Gold Medal Sno-Konette makes it quick and easy!! Electrical REQUIREMENTS: 110v service, 5 Amps - long extension cords NOT recommended. Rental includes machine and dipper only - all other products sold separately! PLEASE MAKE SURE AND RETURN DIPPER WITH MACHINE! Quart Bottle with Spout (for dispensing Syrup) $2.75ea. Available in these fun Flavors!! This machine will crush 500lbs. of ice per hour! Lift the 'pusher' lid and add ice into the curved neck of the machine. Hold red button and gently press pusher lid down - forcing ice into the rotating blades. Your Sno-Kone Machine has rotating blades, NEVER EVER put your hand in the neck of the machine for ANY reason!!!!!! !